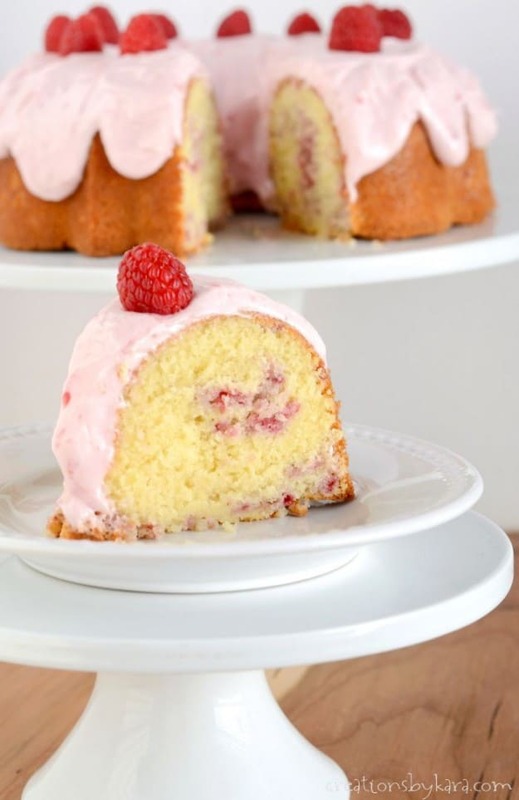 White Chocolate Raspberry Bundt Cake . . . this cake is beyond scrumptious! 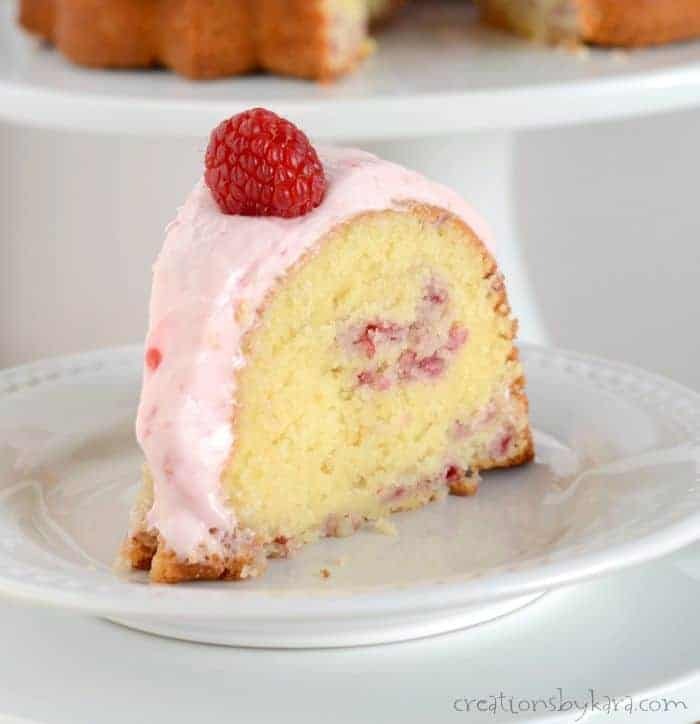 It’s dense and moist and has a beautiful raspberry swirl in the middle. 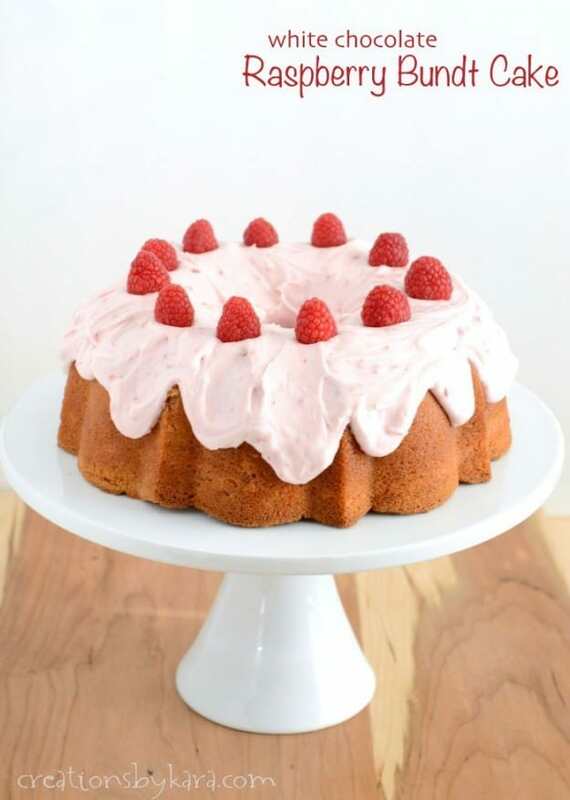 The raspberry cream cheese frosting is so delicious you could eat it by the spoonful. If you want to get extra fancy, you could serve this cake with Vanilla Raspberry Ice Cream or White Chocolate Raspberry Swirl Ice Cream. 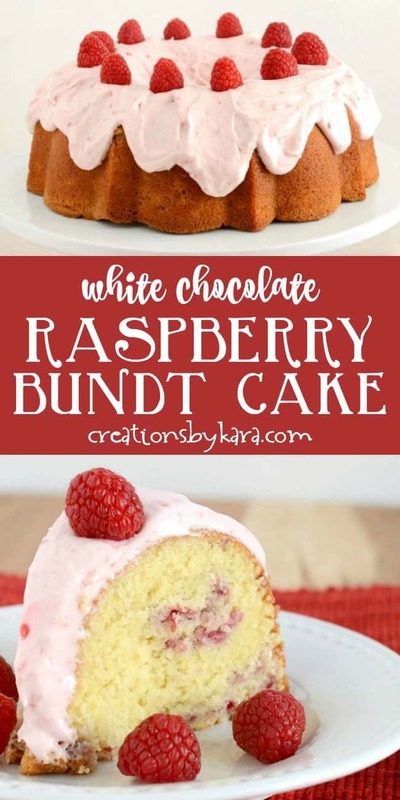 Trust me when I say that you must make this White Chocolate Raspberry Bundt Cake! Not only is it beautiful to serve, it is tender and full of raspberry flavor. And don’t get me started on the raspberry cream cheese frosting. . . .
I’m ashamed to admit that I have made this cake four times, and it took the fourth try before we could refrain from devouring it long enough for me to take photos. Yes, it’s that good. 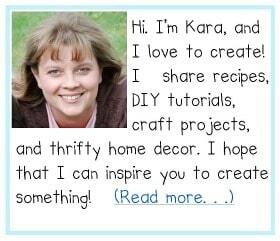 I got the idea for the cake from my friend Brooke at All Things Thrifty. Brooke’s recipe starts with a cake mix, and it was great, but I could taste the “cake mix” taste. I know I’m probably the only one, but I don’t love the flavor of white and yellow cake mix cakes. But the cake was so yummy that I knew it had potential. 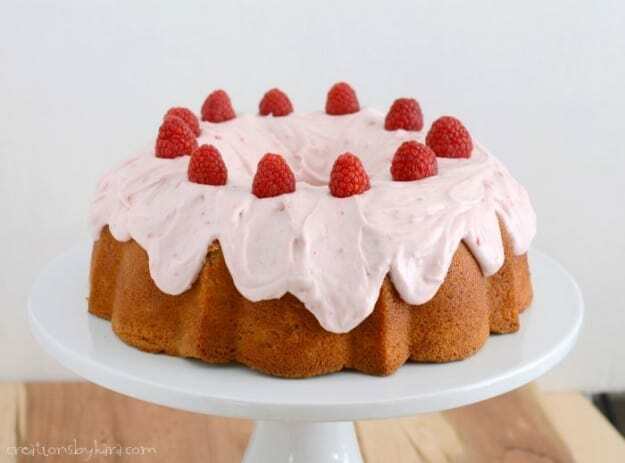 I went to work making a scratch raspberry bundt cake. Thankfully it only took a couple tries to get it just perfect. And by perfect I mean so good that even though you’re stuffed, you want just one more bite. So good that you wish you were all alone so you could lick your plate without anyone judging you. That good. The cake of course is phenomenal, but then there’s the frosting. Oh the frosting. It is luscious. And it makes plenty, so feel free to sneak a spoonful. How can you not? And just so you know, right after I took the photo above, I bumped into my cake plate and sent the whole cake toppling over. By some small miracle, I was able to save it before it rolled off the counter and onto the floor. It was pretty mangled, but we ate it anyway. Now go, run, and make this cake. But don’t run too fast, you don’t want to knock it off its cake stand. LOL! Start off by melting your white chocolate, then just set it aside. Whisk together the dry ingredients, then add the buttermilk, butter, applesauce, eggs, and extracts. Beat with a hand mixer till very smooth. Place about a third of the batter in a small bowl and stir in raspberries and a tablespoon of flour. Into the remaining batter, stir in the melted chocolate. Spread about a third of the white batter into a prepared Bundt pan. Place the pink batter over the top. Spread the remaining white batter over the top, then swirl everything with a knife. Bake the cake at 350° for about 50 minutes, then cool on a cooling rack. When the cake is cooled, beat all the frosting ingredients till smooth and creamy, and spread over the cake. 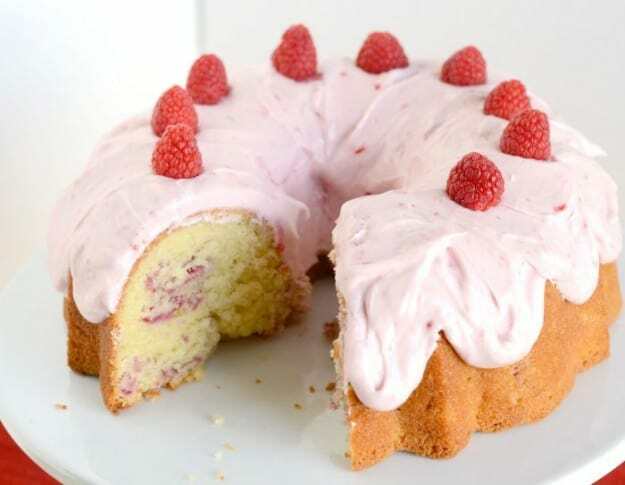 Scrumptious made from scratch White Chocolate Raspberry Bundt Cake with raspberry cream cheese frosting. Grease and flour a Bundt pan (I spray mine with Baker's Joy). Set aside and preheat oven to 350°. Melt the 1 cup of white chocolate in a glass bowl in the microwave at half power, stirring every 30 seconds. Set aside to cool. Whisk together flour, sugar, salt, baking powder, and soda in a large mixing bowl. Add buttermilk, butter, applesauce, eggs, and extracts. Beat for 2-3 minutes with an electric mixer till smooth. Pour about one third of the batter into a small bowl. Stir in the raspberries and the 1 tablespoon of flour. Add the melted chocolate to the remaining white batter. Spread 1/3 of the white batter into the bottom of the Bundt pan. Spoon the pink batter over that. Add the remaining white batter. Swirl with a butter knife or the handle of a spoon. Bake at 350° for about 45-50 minutes. Let cool 5-10 minutes in the pan, then invert onto a cooling rack. 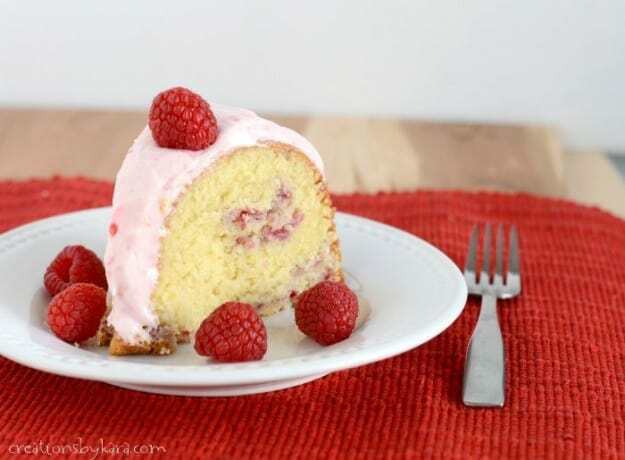 Cool completely, then frost with Raspberry Cream Cheese Frosting. For frosting, beat cream cheese till smooth. Beat in butter, salt, vanilla, and raspberries. Add enough powdered sugar to make a creamy frosting. If you use frozen berries, start with the 1 Tbsp in the frosting, because they are more juicy. Looking for more tasty recipes using raspberries? Here ya go! So did the sour cream, extra egg, & extra baking powder make a difference? I just made this recipe, however it came out so dense. Any suggestions? It’s supposed to be a fairly dense cake, more like a pound cake than a cake made from a cake mix.